Sage Publications, 2003. 2nd edition. Softcover. New. 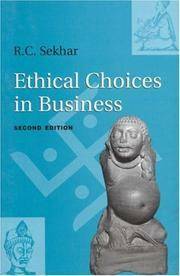 The Second Edition of this highly acclaimed book on business ethics discusses the way in which individuals deal with conflicting questions of personal and professional ethics. While retaining all the features of the first edition which made it a unique contribution to the field, this version adopts a more explicitly pragmatic and optimistic framework, while incorporating suggestions received from scholars around the world. R C Sekhar has also added many new features to make the book more accessible to students and to assist the learning process. Printed Pages: 308.